I received a free copy of this product in exchange for an honest review. I am a bit of a grammar nerd. I love diagramming sentences. I’m often silently correcting other people’s grammar. And that’s why I was so excited to have the chance to review the new grammar program from Classical Academic Press – Well-Ordered Language. Oh and don’t miss the giveaway link at the bottom of this post. 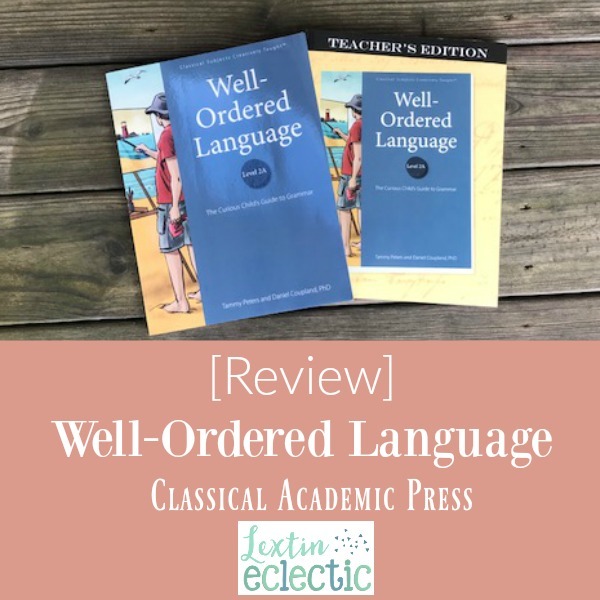 You can win your own copy of Well-Ordered Language 2A for your homeschool!! This is a creative and classical approach to grammar that incorporates chants, songs, stories, fables, and poetry into the teaching of grammar. Why yes! That does sound just about perfect for my homeschool! What about you? Could you use an inspiring and creative approach to grammar? Well-Ordered Language: The Curious Child’s Guide to Grammar 2A is geared for grades 4 or 5. The program introduces grammar in a very incremental way with lots of review so both student and teacher master the material before moving to the next lesson. The book comes with a download of songs and chants to aid in the memorization of the grammar terms. There are also PDF downloads that contain poems, stories, and quizzes to correspond to and enhance the lessons. The program is unique in that it uses a choral analysis method. This means that the student analyzes each sentence orally before diagramming or labeling it. Well-Ordered Language approaches grammar in a creative way using fables and poetry. This book contains 8 chapters – with each chapter taking approximately 2 weeks to complete. At the beginning of the book is a scheduling guide to help structure the program. There are 3 scheduling options: 4 days per week, 3 days per week, or 5 days per week (completing 1 chapter each week to move through the book at an accelerated pace). We chose to do grammar 4 times per week, covering 1 chapter every two weeks. The topic and concepts were introduced and we worked to learn the new songs or chants. We analyzed and diagrammed sentences with the new part of speech being learned. We completed the assignments for Part A – which included a worksheet and some sentences to analyze and diagram. We completed Part B which contained more review. We read and discussed the poem and analyzed a few sentences. We did the Sentences to Practice Page which contained sentences to analyze orally, mark the parts of speech, and then diagram. On this day we finished Part C. These were the last review pages of the lesson. This was my son’s favorite day. We would read the fable or story and then I would ask him questions. Then we would do the enrichment assignments that went along with each story – such as rewriting the ending, having my son narrate the story back to me, or adding more details to the story. On this day he took the final quiz for the lesson. And of course, on each day we reviewed the songs and chants with our CD. You can watch my video review and then don’t forget to read my thoughts listed below! I really like this relaxed yet thorough approach to grammar. The stories and poems really break up the lessons and make the concepts more engaging and more relevant. The songs and chants are a great way for a child who is an auditory learner to remember the grammar concepts. The teacher’s manual has extensive notes and teaching helps. There are ideas for games or for ways to make the lesson more interactive and hands on. Some of these would only work in a classroom but there are often ideas for homeschools or tutoring situations. I really liked that the book comes with more ideas than I would ever need. In this way, the teacher’s manual is very thorough. The concepts are introduced slowly. Some chapters only introduce one part of speech. Therefore, the child has a lot of time to absorb the information and master the concept. Did I mention that we love the stories and the poems? My kids look forward to those lessons every week! The book contains a ton of review. This can be both a pro and a con. If your child has had some previous grammar study, you might be able to move through some chapters more quickly. But some kids will surely need as much review as possible to master the topics, so the review pages can be helpful. The first lesson of each chapter contains quite a bit of reading and explanation. I found that this lesson can feel very long since it doesn’t contain as much student/teacher interaction and is mostly the teacher reading to the student. Sometimes I even broke this lesson up over two days and we covered grammar for 5 days that particular week. The choral analysis is a really unique approach that I’ve not ever seen before. I found it to be very helpful. However, by the end of the book you are analyzing fairly detailed sentences and the oral analyses is long and complex. My son had a hard time remembering the entire wording and it did become a little frustrating to him. I can see how this approach works really well for an auditory learner. Since my son seems to be a visual learner, he preferred to analyze the sentences by marking them and diagramming them. Overall we’ve really enjoyed this grammar program. It’s so different from anything else we’ve ever tried. I feel like it helped my son really internalize the different parts of speech and he can now easily recognize them in sentences. It’s also a program that is easy to adapt. The scheduling is flexible and the amount of review lessons can easily be reduced. And because the teacher’s notes are extensive with lots of enrichment activities and teaching tips, it doesn’t require much planning of the teacher since all the resources and helps you need are included in the book. Would you like to win your own copy of this program? Be sure to enter the review below! This giveaway ends July 21, 2017! The wonderful folks at Classical Academic Press are giving away a Well-Ordered Language Level 2A bundle which includes the student book, teacher’s edition, and an MP3 of all the songs and chants. This giveaway is open to residents of the U.S. and Canada only. Void where prohibited by law. Must be at least 18 years of age. This giveaway is not associated with Facebook, Twitter, Instagram, or Pinterest. No purchase necessary for entry. Selected winners will have 48 hours to respond to email notification to claim their prizes or another winner will be drawn. I appreciate that you showed what using this program in your home would look like each day. This is great! Thanks for sharing. You’re welcome! We enjoy this program. It’s creative and a lot different from any other grammar program we’ve tried. It would be a great program for someone who is musical. And it would work well with any other homeschool curriculum. It has great flexible scheduling options too! I learned to diagram sentences in middle school, but remember absolutely none of it! Haha honestly, I think most people don’t remember it and have no need for it! 😉 I think the most appealing part of this program is that it’s flexible! True! Diagramming doesn’t stay with most people – but learning how to organize your thoughts and knowing how sentences are structured is important. This program takes a really creative approach to teaching grammar. Love it! Thanks for a thorough review! It looks like a worthwhile program. Thanks for the great review! I’ve been eyeing over this program for a while and still can’t decide to make the switch or not. My daughter seems to get grammar one day and forget everything the next day. She loves learning through stories, so I’m wondering if this would be a better approach. My kids have been that way with grammar in the past. This program is great because it has a lot of review and lessons are done on paper, orally, and through songs and stories, so it hits on most learning styles. I love your recommendations- we intended todo 1-a this year, but I think we are going to do a fast paced route to get to 1b and possibly further. We shall see. I dislike grammar but know it is important! I hope you enjoy it! I was surprised with how much Level 1 covered. My kids needed the review and reinforcement that it provided. Was not a fan of sentence diagramming. The program sounds interesting. I love sentence diagramming! It’s fun. I’d love to win this for my granddaughter to use. My daughter would love this! She learns very well with songs, stories, and chants. Thanks so much for your review. My boys are going into 4th, 5th and 7th in fall. Would 2A level be good for all 3? My 7th grader struggles with language arts, so looking to go back an set a stronger foundation, and am thinking this might be perfect. Or would they need go back and start with 1A&B? I don’t want to take them too far backwards grade-wise (esp with my 7th grader); they have be taught grammar previously, so I’m thinking 2A might be more appropriate for the group of them. Does 2A & B cover the same foundational elements in 1A&B, just at a higher grade level? When does 2B come out? I think the 2A level would work well for the younger 2. I’m not sure how the older child would feel about the level. However, if he has been struggling with grammar then this might be a great way to set a solid foundation and help him catch up. It is a fairly meaty and indepth program. I do think you would be able to start in 2A rather than starting in Level 1. Level 2A has review at the beginning so you learn how to do the oral analysis and it starts with a bit of review. Definitely look through the samples online of each level and see if you feel your kids would be able to jump into 2A. I used 2A this summer with my son who is going in to 4th grade. He found it fairly challenging. I feel that kids should at least be in 4th grade before trying it (and it might even be better for a 5th grader or above). Does it cover the same material? It does cover some of the same topics such as types of sentences, adjectives, and adverbs. Level 1A covers helping verbs, direct objects, and subject pronouns. Level 1B covers compound subjects, compound verbs, compound direct objects, and prepositional phrases. Level 2A goes into things like predicate nominatives, predicate adjectives, and possessive nouns. So, I would look through the topics covered in each level and decide which ones your sons need to review – and then choose the level that covers those topics. If you feel your sons struggle with any of the topics in Level 1, then I would probably start there. I’m not sure when 2B comes out but I’m assuming it would come out by Christmas time so people who are using 2A would be able to continue into 2B for the next semester. We’ve been looking at this curriculum. I’m so glad I found your review. It looks like it might be a good fit for my upcoming 5th grader. Thanks for sharing. I really like the flexibility of this program. Thank you for the giveaway. Diagramming sentences was my least favorite part of the day when I was in middle school! I think my favorite part of this has to be the songs and chants. The songs are really fun. It’s a great approach to grammar. I have been looking at this curriculum since it first came out. I have always loved grammar, but I am still hesitant to teach it because I don’t know how to fit it in to our already busy school days. I totally understand! I’ve been working and reworking my schedule for next year. It’s so hard to fit everything in! I haven’t diagrammed a sentence since 8th grade! I don’t even remember how or if I liked it… 😬 I really love the idea of songs and chants to help remember grammar concepts! This curriculum sounds fun!